Leonard, Coleman and Blunt have been around the world and back again several times each as the lead singers of three of the most legendary vocal groups of all time: the Temptations, Platters and Drifters. The three Washington, DC natives have a back-story right out of a Hollywood movie; Leonard, Coleman & Blunt grew up singing together in church and on street corners throughout the 1960s before finding fame and fortune separately, then reuniting after 30 years to harmonize together once again. Glenn Leonard and his sweet tenor voice joined Motown’s legendary Temptations, recording ten hit albums, touring the world, and singing lead on many of their 1970s and 1980’s R&B hits. Joe Coleman joined the Platters for a two-decade stint as the group’s lead singer in addition to gaining a successful career as a songwriter and playwright. Joe Blunt performed and recorded with the Drifters for over a decade in venues all over the world alongside Ben E. King and Johnny Moore, earning a Lifetime Achievement Award from Sony Records. Concert attendees are treated to incredible showmanship, classic dance moves, and some of the biggest hits of all time, including “My Girl,” “The Way You Do The Things You Do,” “Get Ready,” “The Great Pretender,” “Only You,” “Smoke Gets In Your Eyes,” “Under The Boardwalk,” “On Broadway,” “Save The Last Dance For Me,” and many, many more. Then, in 1967, Joe Blunt and Glenn Leonard, fresh out of D.C.’s McKinley Tech High School joined forces in a vocal group called the Chancellors. That same year, the group signed with Capacity Records, and recorded their first single, “Sad Avenue,” which was distributed nationally by Scepter/Wand Records in New York, home to Dionne Warwick, The Isley Brothers and many more hitmakers of the day. The record was produced and arranged by the late Freddie Perrin (the group’s keyboardist at the time) who went on to become the prolific Grammy Award winning producer of such artists as The Jackson Five, The Miracles, Gloria Gaynor, Peaches & Herb, and others. Unfortunately, the Chancellors did not meet with that kind of success. “Sad Avenue” was followed by a second single, “Girls Do Wonderful Things For Boys,” but as fate would have it, neither was a huge commercial success, and the group eventually broke up. Undeterred, Leonard and Blunt continued to follow their dreams of making it big in music, forming another group call The Instant Groove, which eventually evolved into “The” True Reflection, pairing the duo with Blunt’s old Junior Choir chum Joe Coleman and their mutual friend Bobby Cox. The streetwise quartet of singers blended D.C. harmonies and the red-hot early seventies Philly Soul sound that had launched Harold Melvin and the Bluenotes, The Stylistics, The Delfonics and others. Soon, True Reflection was signed to the legendary Atlantic Records with high hopes for major musical success. The group recorded an outstanding debut album with the help of some of Philadelphia’s hottest songwriters, producers and musicians. True Reflection’s first and only release received excellent reviews and featured one regional hit entitled “It Really Hurts,” which was beautifully led by Glenn Leonard in his sweet tenor voice. A national single release called “Where I’m Coming From” received some scattered radio play in 1973, but unfortunately, the project didn’t see much success commercially. “As much as we all wanted it, it just wasn’t meant to be at that time,” said Leonard. The three vocalists soon bid Washington, DC farewell and went their separate ways. It was only then that each of their musical careers took off to the upper limits of stardom. Glenn Leonard was first, receiving the call to join Motown’s legendary Temptations where he went on to record ten hit albums, tour the world, and sing lead on many of the group’s 1970s era R&B hits. It’s Glenn’s sweet tenor you hear on The Temptations best-selling version of the Christmas classic “Silent Night,” which is still played every year during the holidays. Riding high, Glenn relocated to Hollywood, married Darcel, the lead dancer on TV’s hit dance show “Solid Gold,” partied and performed with other Motown stars including The Supremes, Stevie Wonder, The Four Tops, and Rick James, and participated in the huge worldwide Temptations “Reunion” tour with all the original band members. Tiring of the travel, group squabbles and searching for a deeper meaning in his life, Leonard finally left the group in 1983 to recommit himself to the church, becoming a successful full-time minister in the Houston area before eventually returning home to Washington, DC. Leonard was recently inducted into the R&B Hall of Fame. Joe Coleman worked steadily as a much sought-after studio vocalist, songwriter, playwright, and theatrical director before joining the legendary Platters for a two-decade stint as the group’s lead singer. Joe also had a successful international solo career, releasing several singles in Belgium, Holland, Italy and Canada on Ariola, Panarecord and Bump Records, respectively. Joe headlined at Las Vegas Sahara Hotel and Casino with The Platters for several years before finally coming back to the East Coast, where he now splits his time between homes in New York City and Washington, DC. 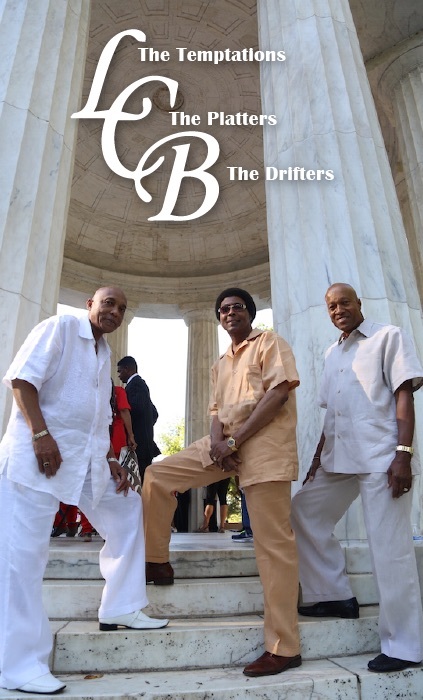 Joe Blunt joined the legendary Drifters, performing and recording with the group with his trademark smooth vocal stylings for over a decade in venues all over the world. During that time, the group experienced a huge resurgence of popularity in the United Kingdom, and Blunt rode that wave, performing dozens of shows alongside Drifters legends Ben E. King and Johnny Moore. Joe recently received a Lifetime Achievement Award from Sony Records for his work on “The Very Best of The Drifters.” Blunt was the only one of the three to maintain his Washington, DC home base when not touring. Once the three childhood pals were all back together in the Nation’s Capital, the old friends soon hit upon the idea of performing together as one unit, singing in unison all the biggest hits from each of their individual careers with The Temptations, Platters and Drifters. The idea was electric and sure to please scores of fans; collectively, Leonard, Coleman & Blunt’s groups have sold over 100 million records with dozens of number one hits everyone in the audience can sing along to. Leonard, Coleman & Blunt concert attendees are now treated to incredible showmanship, classic dance moves and some of the biggest hits of all time, including “My Girl,” “The Way You Do The Things You Do,” “Get Ready,” “The Great Pretender,” “Only You,” “Smoke Gets In Your Eyes,” “Under The Boardwalk,” “On Broadway,” “Save The Last Dance For Me,” and many, many more. Together, Leonard, Coleman & Blunt bring their rich blend of classic hits and a true friendship spanning over fifty years to the stage for delighted audiences lucky enough to catch a performance by the trio of seasoned vocal performers. “It’s a real blessing to be able to bring these great songs to audiences after all these years, and do it with my very best lifelong friends… a real blessing,” says Joe Blunt. A real blessing, indeed.